Health authorities, including the CDC, recommend at least 150 minutes per week of moderate-intensity exercise . . . and I have found the lunch hour is a perfect time to do so! A daily, brisk, 30-minute walk can not only provide long-term health benefits, but an immediate boost to your brain power for the rest of the day! In 30 minutes you can cover between 1.5 to 2 miles and burn as many as 200 calories. And if you do this daily during your work week, you will have achieved the 150-minute requirement to help combat the health risks of inactivity and obesity! Include the benefit that comes from a perfect opportunity for some prayer and intercession, and how can you go wrong? In fact, today’s walk lent itself to a word of encouragement in that regard. So enjoy! And let’s walk! Proverbs 3:5-6 Trust in the Lord with all your heart and lean not on your own understanding; in all your ways acknowledge Him and He will make your paths straight. 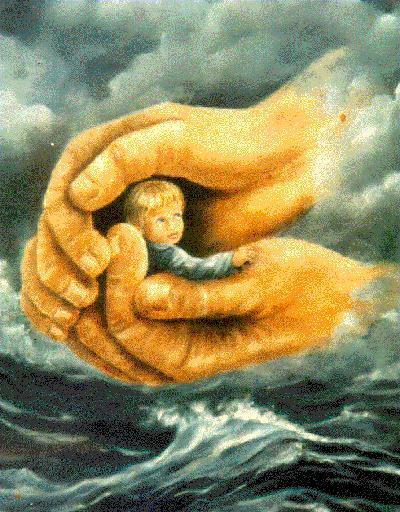 I Peter 5:7 Cast all your cares(s) upon Him; for He cares for you. I have to admit that I’ve handed my cares over to the Lord several times during the past few months, and most recently, this past Sunday morning. But by Monday afternoon, I realized they had returned once again when that old familiar heartache and the heavy weight that accompanies it settled firmly upon my chest. I began to question whether or not I was really understanding the Truth of God’s word for me in this situation, and so I decided to do a word study of 1 Peter 5:7. While doing so, I learned that the Greek word for “cast” is actually an action word that means “to relinquish, surrender, or hand over – once and for all”; and the Greek phrase “for he careth for you” translates “for he meddles, or concerns himself with the things that are of importance to you.” Wow! What an amazing thing to consider! The Creator of the Universe concerns himself with the things that are of importance to me! I also found some other definitions for to “cast” in Webster’s dictionary. They are to “abandon”, to “get rid of”, to “shed” . . . and it got me to thinking . . . when a dog sheds its fur, have you ever tried to reattach it? That would be virtually impossible, wouldn’t it? I suppose maybe you could try to glue it back on, but it probably wouldn’t stick very long and if it did, I would imagine it could create sores and infection and ultimately injure the dog. In the same way, when we try to take our cares back on us, they can make us sick physically and spiritually. Our precious Father doesn’t want this for us! Now imagine, if you would, a 20-gallon water bottle hanging from your neck day after day after day. . . and the pain and misery it would inflict on your body as you tried to constantly carry it around in this manner . . . and the lack of sleep and discomfort you would feel as it hung heavily from your neck, shifting in the bed, dangling down the side of your mattress, tugging and pulling at you night after night after night. “To cast, to get rid of, to shed, to abandon . . . once and for all” doesn’t mean removing it and setting it aside, where you can keep your eye on it and then hang it around your neck again later. Instead, to shed it once and for all is to remove the cap off the container of your heart and your mind and to pour it out, every drop, into the ocean of his mercy. . . never to gather it back to you again! It’s the once and for all requirement that we need to abide by. And when we do that, what do we receive in return? But when we surrender our cares, trusting and knowing that the One who loves us the most is working on our behalf, our hearts will be filled with joy and peace, and our mouths will be filled with worship and praise. “We receive love. In his book, “Reflections for Ragamuffins,” Brennan Manning writes, “You will trust God only as much as you love Him.” But you know what? You will also only love God as much as you trust Him. When love and trust are combined, they are a like a match to our faith. They will set our confidence on fire so that we can go anywhere that God is taking us without fear” . . .
because we are trusting in the Lord with all of our hearts and leaning not on our own understanding. “Cast all your cares on Him because He cares for you“. God wants us to give all of our cares to Him – once and for all– so that we can stay well, watch Him work through it, and “in all our ways acknowledge Him”. It means, I have to stop trying to be in charge of the situation, give it completely to God, and then sit back, be still, and listen for His direction in the matter. By giving it up, I’m allowing God to take care of it. And I know that He can and He will . . . because He loves me. Dear Lord, I know I’ve been too controlling of my own life and the troublesome situations I’ve been facing, and, Lord, I need for You to take charge. Today, Lord, I’m releasing my cares to You once and for all because I trust You. Lord, help me to learn from and lean on Your faithfulness. Remind me that You will meet my every need and will never leave me, so that I may confidently place all of my cares and all of my future, all of it, in Your hands. I thank You, Lord, for Your wonderful power and love over my life. And I ask all these things in the precious name of Jesus. Amen. If you’re trying to lose weight, it may be time to go to the mattress! In a University of Chicago study of overweight adults who were following a balanced, restricted-calorie diet, subjects lost 55 percent more weight as fat (almost two pounds) after two weeks when they slept for 8.5 hours each night, compared with a period of sleeping only 5.5 hours. When you’re short on shut-eye, study authors say, your body produces more ghrelin, one of the hunger hormones, and with less rest, you set yourself up to pack on the pounds! In the same way, if you take time to “rest” in the Lord, you can also lose some “weight” – all those heavy burdens you’ve been struggling to carry around on your own for so long. “Come to me, all you who are weary and burdened, and I will give you rest. Take my yoke upon you and learn from me, for I am gentle and humble in heart, and you will find rest for your souls. For my yoke is easy and my burden is light.” Matthew 11:28-30 This is a gracious invitation from Jesus to all who would want to experience the relief, joy, and the blessings of His life through a grace/faith relationship with Him. For those without the Savior, it’s to a call to believe in Him. For those who are already believers, it’s a call to follow him as a committed disciple; a call to completely turn our lives over to Him. So won’t you join me? It’s time to go to the mattress, get some rest, and lose some weight!!! As part of my mid-life goal to get fit and healthy, combined with my zeal for some new and exciting adventures, I began attending Zumba classes at a local church down the road several months ago. 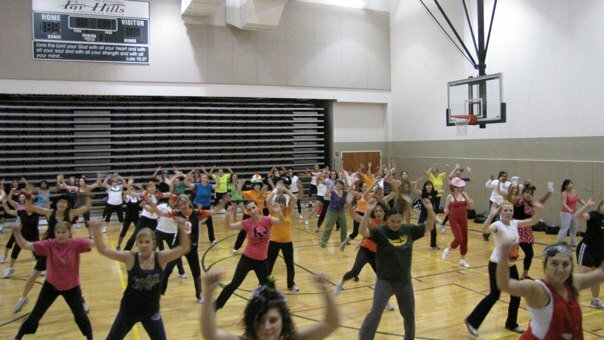 For those of you unfamiliar with Zumba, it’s a dance-inspired workout where Latin, hip-hop, belly-dance, and other great dance moves (like Hava Nagila) are incorporated into an aerobic routine. It’s great fun, plus it’s a fantastic workout. Two to three times each week, I can be found standing in the back of a church gym filled with 150-200 women. Dressed in black sweatpants and an oversized T-shirt, I focus on our Zumba instructor, Janae – an amazingly fit young woman, dressed in the cutest Zumba attire, without an ounce of fat on her super-athletic body. I keep hoping that (while I’ll never be as young as she is), if I stick with the classes, perhaps I can look at least a tenth as good as she does. One can only hope! A wonderful leader, she is one of the reasons I so enjoy the classes. Her smile is genuine and contagious, she loves to laugh, and even better, she loves the Lord. The joy of the Lord truly radiates from her and even while dancing, you can tell she has a worshipper’s heart. She opens each class with a scripture reading and her closing “cool-down” sessions are done to beautiful worship songs. How great is that? Needless to say, I’m totally hooked! One of the recommendations to Zumba participants is that they should wear lightweight supportive shoes that will enable them to easily move forward, backward and side-to-side, because Zumba steps will take you all across the floor. It is also suggested that you watch your instructor for cues to every step because Zumba instructors are trained to speak very little; instead, they cue participants with hand and body gestures as well as provide clear demonstrations of steps and combinations. In other words, the workout is basically watch and follow, as the participants mirror and imitate the leader. Let me just say . . . my experience has proven this to be true on many occasions! This past Monday, as I once again took my eyes off of Janae for a moment, I found myself turning in the opposite direction of everyone else in the room. Fortunately the class is very gracious and non-judgmental (probably because the same thing has happened to many of them at one time or another)! But when it happened to me this week, the Holy Spirit immediately brought two scriptures to my memory: “I tell you the truth, the Son can do nothing by himself; he can do only what he sees his Father doing, because whatever the Father does the Son also does.” (John 5:19) “Be imitators of God, therefore, as dearly loved children and live a life of love, just as Christ loved us and gave himself up for us as a fragrant offering and sacrifice to God.” (Ephesians 5:1-2) The Lord then went on to say “keep your eyes on me and I will order your steps.” What a great lesson to learn in the midst of a Zumba class! When I got home that night, I decided to investigate a little bit further what the Lord had said, and I found that the verb imitate and the noun imitator only appear a total of eleven times in the entire New Testament. I also learned that this Greek family of words is the root from which we get our English equivalents mime and mimic. An actor that is proficient in mime entertains us by using only gestures and facial expressions, never speaking a word . . . similarly to the way the Zumba instructor leads a class. Jesus was Paul’s “All in all,” as he wrote in Galatians 2:20, “I have been crucified with Christ and I no longer live, but Christ lives in me. The life I live in the body, I live by faith in the Son of God, who loved me and gave Himself for me.” We are not only to imitate Jesus as our role model, but we must also become role models for others. In I Timothy 4:12 Paul charges Timothy: “. . . set an example for the believers in speech, in life, in love, in faith and in purity.” Then in Titus 2:6-7 he compels Titus, “Similarly, encourage the young men to be self-controlled. In everything set them an example by doing what is good.” Role models set an example for others to imitate. So my Zumba lesson from this week is this: let’s keep our eyes focused on our teacher, Jesus Christ, so we never “miss a step” . . . and remember, too, that others are also watching us and following our example! 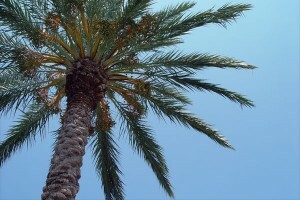 Palm trees are monophyletic; there are 2,600 species of palm trees, all of which can be traced back to one palm tree. As a palm tree ages, it become more and more productive. The older the palm tree is, the sweeter the fruit. Every bit of a palm tree is used for different purposes. 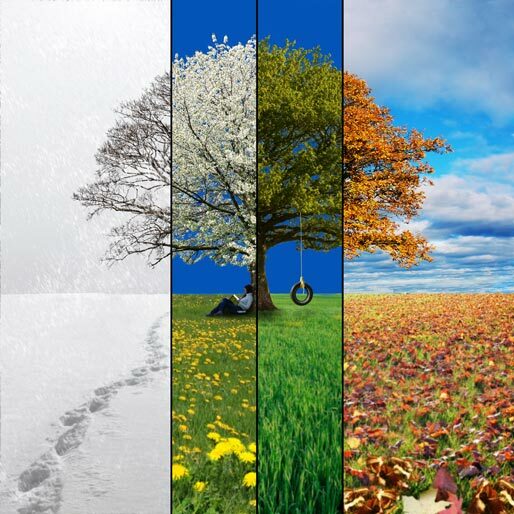 A palm tree doesn’t have a season; it’s always in season, always green, and continually produces fruit. Palm trees have vast root systems that spread and grow deep, seeking out water. The larger the root system is, the taller the tree. The palm tree sends from the same root a large number of suckers, which in time, form a forest by their growth. Palm trees thrive in extreme, adverse conditions. A group of palm trees in a desert forms an oasis and provides a protective covering for those seeking shelter from a harsh environment. Other species of smaller trees will actually grow in their shade. Are you righteous? Then if so . . . no matter what your age or the adversity that surrounds you, you will thrive and stand strong in the midst of adversity, you will produce much good fruit (and even more so as you grow older and more mature in the Lord), the lost and hurting will be drawn to you, and you will make new disciples. And just as John saw palm branches being used to honor and praise the King of Glory, so should the life of a Christian on earth bring honor, praise and glory to the Lord Jesus Christ. who in the natural would come to their rescue. Oh, Lord, with clean hands and a pure, pure heart . . .
never with ulterior motives or for fleshly gratification. In spirit and truth, let me wave my palms before you. So today and every day, let’s make like a tree, shall we? All it takes to reap these benefits is to start a routine of brisk walking. It doesn’t get much simpler than that. The good news is that walking — even only a modest amount — provides immediate health benefits. 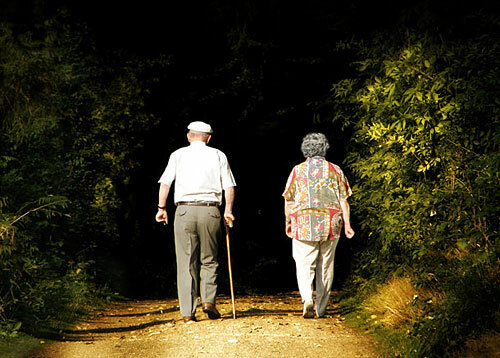 Unfortunately, even though many people know the benefits that walking affords, they choose not to. Many people think, “I really should get some exercise; maybe I’ll go for a walk”, but the television or a good book captures their attention instead . . . or they remember they have something else to do and a long walk would interfere . . . or it’s too early, too late, and they’re just too tired . . . or the thought of exercising is just simply unappealing, so they sit down again . . . or never rise up in the first place. Exercise is an individual decision and it’s not enough to just desire to go for a walk. You have to actually do it. Everyone is free to walk or free to sit . . . but whatever your decision, it will have an impact on your health. Build walking into your schedule today. For example, walk for 10 minutes on your lunch break. After a few days, increase your walking time to 15 or 20 minutes. Then, for maximum benefits, work your way up to 30 to 60 minutes a day, every day. Keeping a record of how many steps you take, the distance you walk and how long it takes can help you see where you started from and serve as a source of inspiration. Just think how good you’ll feel when you see how many miles you’ve walked each week, month or year. Record these numbers in a walking journal you create for yourself or log them in a spreadsheet on your computer. Another option is to use an electronic device — such as a pedometer — to calculate time and distance for you. Starting a walking program takes initiative. Sticking with it takes commitment. But when you think of the potential health benefits, it’s well worth your effort. Over time you’ll likely feel more invigorated. To stay motivated, why not share the experience? If you don’t like walking alone, invite your spouse, partner, friend or neighbor to join you. Keep it interesting. Vary your routine and plan several different walking routes for variety. Even though the first steps of any journey can be the most difficult, it helps to keep your goals foremost in your mind. So remember, once you take that first step, you’re on the way to an important destination — better health. As the Mayo Clinic so aptly put it, this form of exercise is also accessible to everyone. It’s free, safe, simple, doesn’t require practice, and the health benefits, in this case, are out-of-this-world! Unfortunately, even though many people have heard about the benefits of walking with the Lord, they delay their decision to do so or simply choose not to. Some people say I am a good person anyway, so why do I need Jesus . . . or I am too bad to be saved . . . or there are too many hypocrites in the church . . . or I can’t live that kind of life . . . or I need to get some things straightened out before I get saved. Many unbelievers today do not doubt the existence of God and the facts concerning salvation. It is just a matter of what’s of value to them. Sadly, they are just too occupied with other people and activities which are of more importance to them than either the Lord or His blessings of salvation. Because they are so busy with the affairs of this life, they can’t be bothered with the inconvenience of walking with Jesus. They consider God and His offer of all the blessings of salvation to be of little importance and value. Tragically, their wrong priorities and their excuses will keep them from someday walking on streets of gold and experiencing the blessings of the Kingdom forever! This walk is an individual decision and it’s not enough to just think about it. You have to actually do it. Everyone is free to make their own decision in this regard. . . but whatever your decision, it will have an impact on your spiritual health and your eternal destiny. For those who have never walked this particular walk, the first thing to consider is ~ you’re not here by accident. God loves you. He wants you to have a personal relationship with Him through Jesus, His Son. There is just one thing that separates you from God. That one thing is sin. All that’s left for you to do is to accept the gift that Jesus is offering you right now. The Bible uses two terms to describe what happens when people say yes to God and join His family: born again and adoption. To be born again means that the new Christian is part of God’s family just as certainly as they are part of their earthly parent’s family. He is their Father, and they are His children. (See John 3:3-8.) The other term used to describe this relationship is adoption. Even though all humans are born in a condition that inevitably leads to death, Christians are adopted into God’s family and given all the inheritance rights of God’s Son. Because Jesus rose from the dead, those who trust in Him will, too. Because Christians are part of God’s family, they can feel completely secure. He will not disown them or rewrite His will. He has promised to be faithful to His children, and God always keeps His promises. As children of God, Christians can have power to follow Jesus even when the way is hard, power to make Jesus known to others, power to love and to serve. His children also have hope. No longer will they fear that death will ruin their plans and destroy their relationships. Instead, they have confidence that God will raise them to life in a new world where all is life and peace and joy. Now – Some Beneficial Exercises! Next, you’ll want to read what God has written to help you stay on the path and finish the course. Think of a daily appointment in God’s Word – the Bible – as being wonderful nourishment and strengthening for your spiritual body. A person does not enter a marathon without lots of training and building up to that event. So, too, as you explore God’s Word on your daily walk, it’s okay to start with small steps. Why not start off by trying to spend 10 to 20 minutes every day in God’s Word? By the end of the first week, you’ll have spent over 2 hours with Him as He speaks to you through His Word, and as you get to know Him better, you’ll want to spend more and more time with Him, hearing what else He has to say to you! And with that being said, He wants to hear from you too! Make prayer a habit. This means talking to God about anything, at any time of the day or night. It also means spending a “quiet” time with Him where you meditate on His Word, tell Him of your love and devotion, and talk to Him about others and their needs. In any relationship, communication is vital. Keeping a daily record of your spiritual walk can help you see where you started from and serve as a source of inspiration. A Christian journal is a place where you can write down your prayers, collect your thoughts on the things God is teaching you, record Bible passages and the wisdom and insight you’ve gained from reading them, and record the amazing things God has done in your life. It can be an amazing tool to help you record God’s transforming work in your life. Sometimes we tend to forget just how many times God has answered specific prayers, made timely provision, and done marvelous things in our lives, but having a place to collect all these memories prevents their being forgotten and reminds us of God’s faithfulness to us. When you experience something that has a positive effect on your life, you want to share it don’t you? Why do you suppose Zumba, Spin Classes, Step Classes, etc. are so immensely popular? It’s a shared experience where everyone is enjoying the exercise and benefitting from it together. When a new Christian opens the door to Christ and comes home to God, they acquire a new set of spiritual brothers and sisters – God’s other children on earth. It is important for God’s family to meet together regularly. Churches are where God’s people gather to worship Him together, learn from the Bible, encourage each other, and welcome new believers into God’s family. Baby Christians need to be nurtured, protected, taught, and loved, and the church is the best place for them to gain the support they need to grow tall and strong. Find a church near you that does these things, and get involved. Your church should believe that the Bible is the accurate Word of God, that Jesus Christ is God’s Son, that He is fully God and man, and that only through faith in Jesus Christ can a person have eternal life. As you continue your walk with the Lord, there will also be other ways that you’ll want to share the experience. There are friends, family members, and many in our neighborhoods and world who do not know the Lord or don’t know His Word. But we do, don’t we? And we’re experiencing the wonderful benefits of doing so! Jesus prayed for his disciples and for us, the children of God the Father, on the night that he was betrayed when he said in John 17:17, Sanctify them by the truth; your word is truth. As you sent me into the world, I have sent them into the world. As those who know the truth of that Word, our calling is to go to our neighborhoods and throughout the world to proclaim the truth of that Word. In that same passage Jesus says My prayer is not for them alone. I pray also for those who will believe in me through their message, that all of them may be one, Father, just as you are in me and I am in you. May they also be in us so that the world may believe that you have sent me. As Jesus sent the disciples into a world in need of the Word ,so also today, by the power of the Holy Spirit, we are sent into the world to proclaim the story of Jesus as Savior. And sometimes that involves walking! Walk across the hallway from your apartment or across the street from your house to be the hands and feet of Jesus to a neighbor in need. Walk to the cubicle next to you and proclaim the hope of Jesus to a coworker. Walk the neighborhood and pray for the salvation of those who live in your community. There are many ways that we can walk in the Word to make an eternal difference in the lives of those around us, but it starts with our own connection to Jesus. He is the one who gives us the strength through the Spirit to know the truth of the Word and to proclaim that truth in Word and deed in our lives and through the lives of people throughout the world. The apostle Paul writing to the church in Rome quotes from the prophet Isaiah when he declares, “How beautiful are the feet of those who bring good news!” May God strengthen your walk this week as you spend time with Him in His Word and as you go forth to proclaim the joyous Word of Christ to your families, neighborhoods, schools, and world. It’s a special path that He wants all of us to be on. Even though the steps of any journey can be difficult at times, it helps if you keep your goal foremost in your mind. So remember, once you take that first step, you’re on the way to an incredibly gratifying walk . . . and a very important destination! John 3:16 For God so loved the world that He gave His one and only Son, that that whoever believes in him shall not perish but have eternal life. Revelation 21:1-7 Then I saw “a new heaven and a new earth,” for the first heaven and the first earth had passed away, and there was no longer any sea. I saw the Holy City, the new Jerusalem, coming down out of heaven from God, prepared as a bride beautifully dressed for her husband. And I heard a loud voice from the throne saying, “Look! God’s dwelling place is now among the people, and he will dwell with them. They will be his people, and God himself will be with them and be their God. ‘He will wipe every tear from their eyes. There will be no more death or mourning or crying or pain, for the old order of things has passed away.” He who was seated on the throne said, “I am making everything new!” Then he said, “Write this down, for these words are trustworthy and true.” He said to me: “It is done. I am the Alpha and the Omega, the Beginning and the End. To the thirsty I will give water without cost from the spring of the water of life. Those who are victorious will inherit all this, and I will be their God and they will be my children. 1Corinthians 9:24-26 Do you not know that in a race all the runners run, but only one gets the prize? Run in such a way as to get the prize. Everyone who competes in the games goes into strict training. They do it to get a crown that will not last, but we do it to get a crown that will last forever. Hebrews 12:1-2 Therefore . . . let us throw off everything that hinders and the sin that so easily entangles. And let us run with perseverance the race marked out for us, fixing our eyes on Jesus, the pioneer and perfecter of our faith. Philippians 3:10-14 Forgetting the past and looking forward to what lies ahead, I press on to reach the end of the race and receive the heavenly prize for which God, through Christ Jesus, is calling us. the scenery . . . the faces . .
different people . . . different places . . .
but the call remains the same . . .
light and salt . . . today . . . always . . .